Both recipes are adapted from my friend Shauna's book Marshmallow Madness! (highly recommend!). I increased the gelatin slightly to make sure the marshmallow batter would pipe well and hold up to a second layer stacked on top. I couldn't have asked for better results! The key lime marshmallow flavor is so delicious, and together with the crunchy cone it reminds me of key lime pie. The pink vanilla layer swirled on top is a nice compliment, too. After the marshmallow is piped and set, the layers really stick together well, so I wouldn't hesitate to make these for a kid's party. There's no chance of the marshmallow falling off/out of the cone, and it's something that would be so easy for little hands to hold. These were a delight to make, and pretty easy, too. Just a note - like most marshmallow recipes, you'll need a candy thermometer to make these. If you need a large french star piping tip, you can buy one here. You'll be making two consecutive batches of marshmallow for these, so when you get finished piping the first layer in the cones, be prepared to wash up your saucepan, piping tip and batter bowl for the next layer. I tried dividing one batch of marshmallow into the two colors and flavors, but after piping the first color (lime), the second color had already begun to set up. An attempt at re-whipping only made the vanilla layer lax and un-pipeable. Two consecutive batches is the way to go, here. Small glasses make a nice holder in which to stand the cones upright while piping. I used 2 oz. 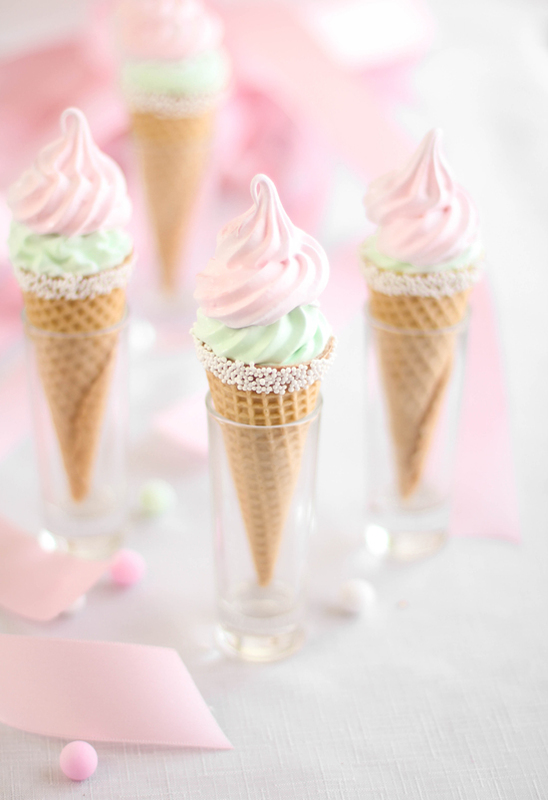 cylinder dessert glasses (pictured). 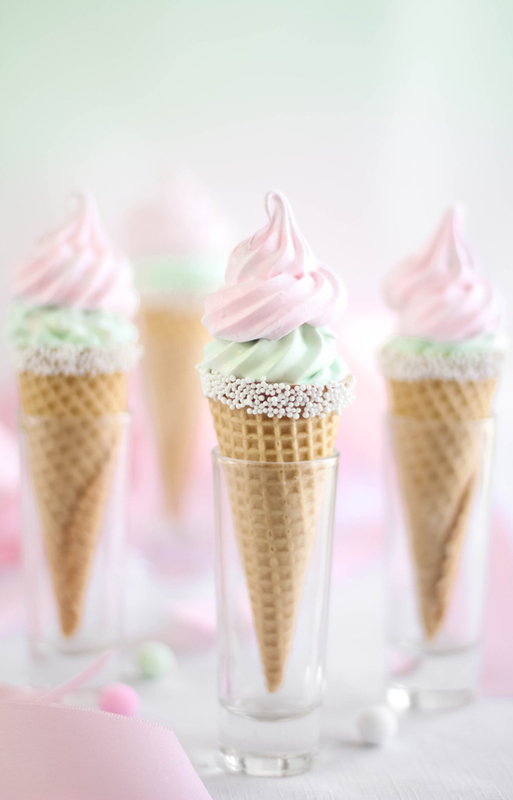 Brush piping gel or clear corn syrup around the top edges of 15 ready made sugar cones. Place the nonpareils on a small plate and then roll the edge of a cone in the sprinkles. Repeat with remaining cones and leave to dry on parchment paper. Have the cones placed upright in glasses and ready to receive piped marshmallow. Have ready to hand a large pastry bag fitted with a large french piping tip. Whisk together in a small bowl - gelatin, key lime juice and 1/4 cup cold water. Let set for 5 minutes until gelatin absorbs liquid. In a saucepan with a candy thermometer inserted, combine sugar, 1/4 cup corn syrup, 1/4 cup water and salt. Place over high heat and bring to a boil. Meanwhile, pour the remaining 1/4 cup corn syrup in the bowl of a standing mixer fitted with the whisk attachment. Heat the gelatin in the microwave or on the stove-top until melted completely and pour into the mixing bowl with the corn syrup. Turn mixer on low and keep it stirring until the sugar syrup is ready. When the syrup reaches 240F. slowly pour it into the mixer bowl. Increase the speed to medium and beat for 5 minutes, then increase to medium-high and beat 5 more minutes. Finally, increase to highest speed and beat 5 more minutes, until tripled in volume. Add food coloring and beat until incorporated. Immediately scoop marshmallow into the large piping bag - do not tarry here -and quickly pipe the mixture into the cones, swirling in a circular motion as you pipe. Whisk together in a small bowl - gelatin and cold water. Let set for 5 minutes until gelatin absorbs liquid. When the syrup reaches 240F. slowly pour it into the mixer bowl. Increase the speed to medium and beat for 5 minutes, then increase to medium-high and beat 5 more minutes. Finally, increase to highest speed and beat 1-2 more minutes, add vanilla then beat again for 1-2 minutes. Mixture should be opaque and tripled in volume. Add food coloring and beat until incorporated. Immediately scoop marshmallow into the large piping bag - do not tarry here -and quickly pipe the mixture into the cones, swirling in a circular motion as you pipe. Tip: Combine 3/4 cup confectioners' sugar with 1/2 cup cornstarch and dust the cones with this mixture. This will take away any stickiness and makes them easy to bag in cellophane for party favors. They look so pretty! What a wonderful idea. Gorgeous (as always)! You are so my idol. Would you please provide the weight equivalent for your 5 teaspoons of gelatin? I would love to see all recipes use weight instead of volume measurements... it's so much more accurate! Thank you so much! 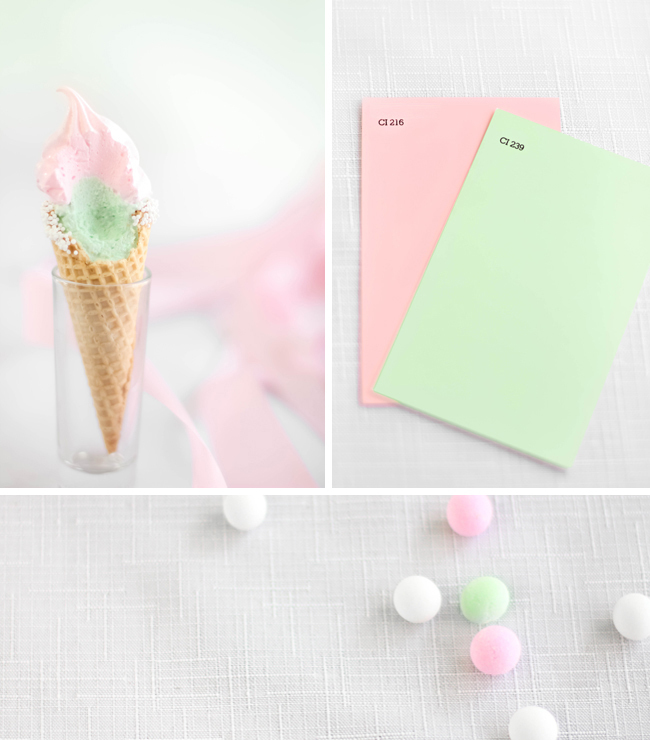 I am hosting a baby shower in April using these exact colors!! Lovely, lovely lighting in your photos. What a fun idea for Easter! So delightful. So dreamy. What a perfect treat at a children's birthday party! Wow..this is such a cute idea!! I love these; but where do you find the mini sugar cones? Genius! I'm already thinking of a way to use these! Chef Beth - 5 teaspoons is about 3/4 oz. Claudia - they are't mini, I used the standard size cones that you get at the grocery store. Oh! thank you so much, love your work! Wow these are beautiful. I'd like to eat one of those cones right now. Perfect for spring! Aww so cute and clever! And those spring colors! Yum. Beautiful, luscious and no doubt delectable! These are so cute. They would make great Easter treats for sure! Yummy! These look delicious and cute! They'd be perfect for a friends birthday- the only problem is that she's vegetarian. Is there any way I could substitute the gelatin? I love making marshmallows and have been eyeing up this particular method! I love the color and flavor combination here, super pretty and springy! these are adorable and so perfect for spring! 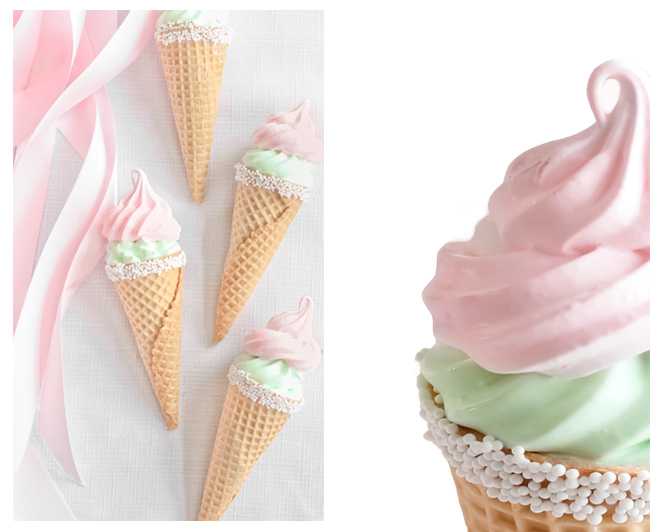 i love the marshmallow in the cone, too cute! Siriusyareader - There are vegetarian gelatins out there; some of the kosher varieties (not all). I think Hein may be one brand. I have a friend who is vegetarian and so I've bought some before for various projects around her birthday. Would a simple honey and water solution work (in place of the sugar, water and corn syrup)? I try to avoid corn syrup and typically make a honey, gelatin and water version of marshmallow, was wondering how that would work out and in what measurements to get the right end product. OMG, I love these! I am making a dessert table for my niece and this would be a perfect addition! Thanks! So, so pretty! Would be perfect for a baby or bridal shower this spring! These are so cute! I love them. you are so genius! Pretty! Makes me think of spring! What a wonderful idea for a marshmallow holder (other than my finger)!I do love marshmallows. :) They look so pretty. By customizing the colors they would be great at a baby or bridal shower! These are just so lovely I could cry. Well done, as always. Hei, can I melt store bought marshmallows and use those? Would they return to their original consistency? No, I'm afraid that won't work. The marshmallow won't hold its shape after melted. Oh my word - your pictures and recipes are just amazing. I'm love love loving your blog.